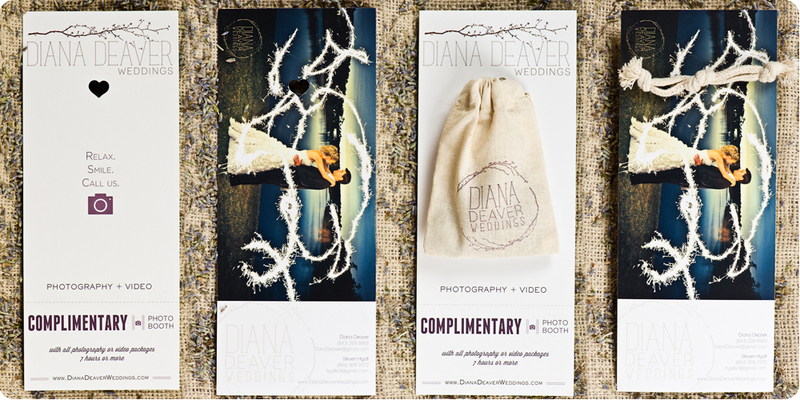 Recently we decided Diana Deaver Weddings was in need of some branding work. After some searching we got in touch with Ravyn at Three Fifteen Design to have her design a logo for our wedding photography business. We were thrilled both with working with Ravyn and the resulting new logo. We decided that along with the new logo must come new materials for packaging, promotion and the like for a more complete branding package. You can’t have a beautiful new logo and not have equally beautiful material for it to be on. With that in mind we set out to design new business cards as well as a new postcard. We love the results and are excited not just to share it with you, but also to tell you exactly how we did it. 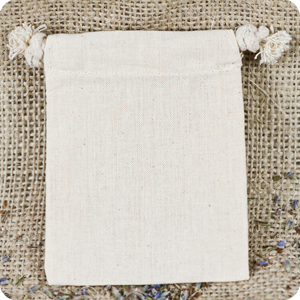 First, let us go ahead and show you the final results, a beautiful postcard with tear off business card complete with a custom hand stamped muslin bag filled with organic French lavender. While we will also be producing more “traditional” business cards, these will serve the purpose of both a postcard and a business card in one while also being able to be put in goody bags and other places for people to take with them. 300 of these cards will be put in the goody bags for the 2012 Charleston Bridal Show on March 24. If you will be there then we look forward to seeing you and hope you enjoy these special items that we put so much of ourselves into! To save money we decided to do the design of the cards ourselves, but first we had to decide what we were designing. After much thought and research we settled on a 3.5×8.5″ rip business card from GotPrint printed on 100lb. recycled matte paper. 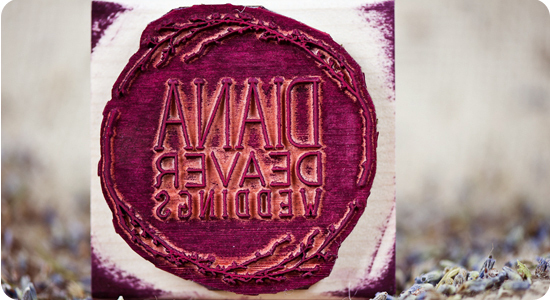 Our logo was designed with natural elements in mind so we loved the idea of Earth friendly recycled paper. Plus it has a very nice, heavy weight and the matte finish fits in very nicely with the natural theme. The nature of the card itself would provide us with both a postcard and a business card that has been perforated in order to be easily torn off the bottom. As a unified piece it is large enough to stand out, but not so large as to be cumbersome. You can download templates from GotPrint’s website that allow you to design directly on them while having the peace of mind that all sizing, resolution, and color space details are correct. We designed ours in Adobe Photoshop. After selecting the color ink we wanted to use we set to work stamping each bag….by hand….one at a time….a few hundred times. It sounds time consuming because it is, but it’s so worth it in the end to have a custom, hand made bag to hand out with your name on it. Thus far we have stamped some 300+ bags with a single ink pad and it’s still going strong. Once we decided on ordering and stamping the muslin bags we had to decide what would go in them. We have a sample of our wedding photography and a nice design that are pleasing to the eye, we have the thick recycled paper and muslin bag whose combined textures are pleasing to the touch, so it was only sensible to add to the overall sensory experience by adding something that is pleasing to smell. 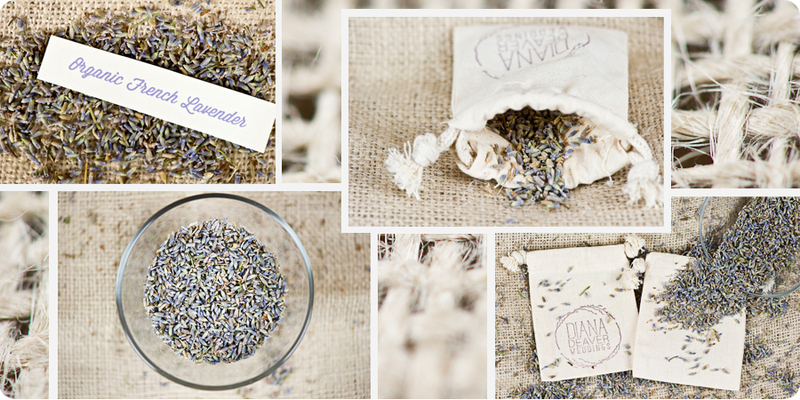 We decided on organic French lavender for a few reasons. One, it’s organic, and we love organic. Two, it is readily available at a reasonable cost. We ordered ours from this Amazon page. 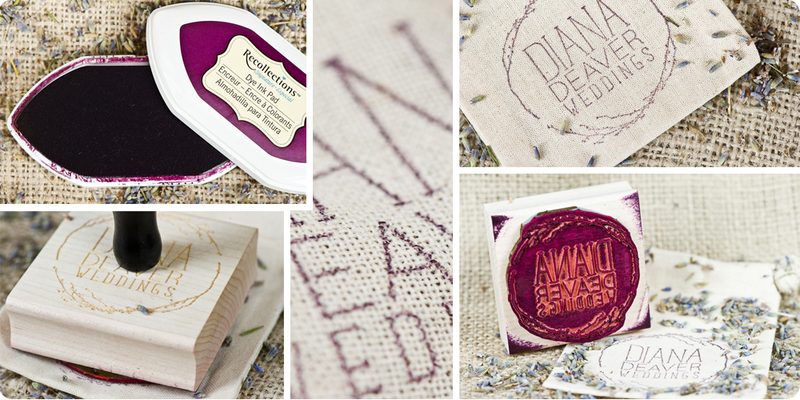 Third, we used purple in the design of our card and as the ink color for our stamp, so the purple of the lavender was a perfect fit. Finally, it just smells great! In fact, the first person we gave one to immediately said “This smells like lavender” with a big smile on her face. 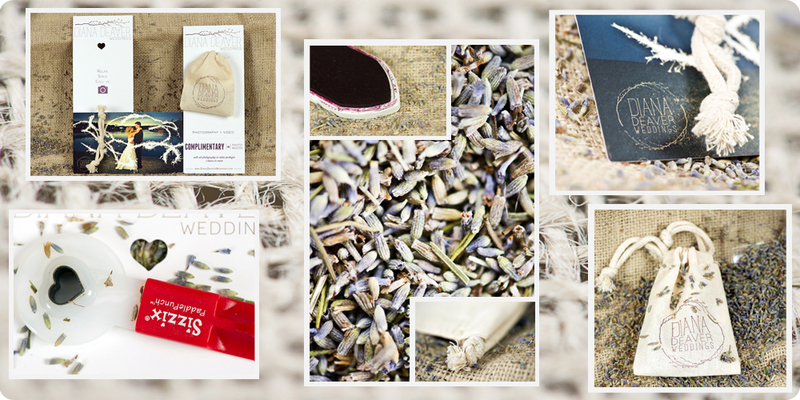 We used a very special device to put the lavender into the bags….a ladle from our kitchen! We have filled approximately 100 muslin bags with each 1 lb. bag of lavender we ordered. Next we had to decide how to combine our card and our bag of lavender. We considered several options, including glue, but decided that didn’t really fit with the overall feeling we were going for. We wanted something that was a bit more organic and integrated between the two pieces. We initially considered punching a hole, but a simple round hole somehow didn’t seem quite right. It didn’t take us long to decide that a heart would be the perfect shape to fit with the card and the theme of wedding photography. Afterall, it is a symbol of love! 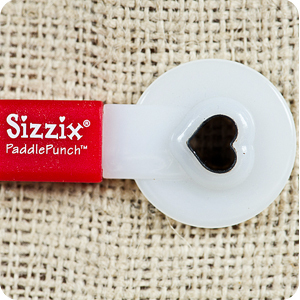 We had no idea just how elusive such a punch would be though….. most of the heart shaped hole punches would not reach far enough for us to place the heart where we wanted it, and those that did were entirely too large. A good bit of manual work went into the design and preparation of these cards, but the end result is very rewarding. 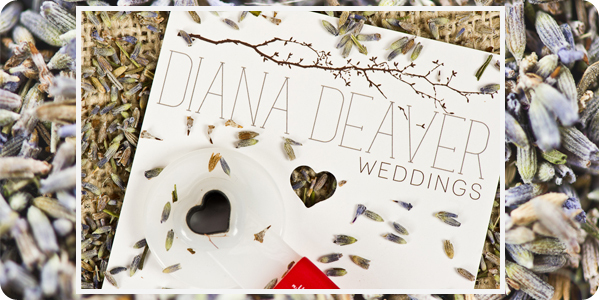 Each person who gets one of these cards will be receiving something unique to Diana Deaver Wedding Photography that was made with our own hands, and that’s a perfect symbol of the individual, personal attention we seek to give to every couple whose wedding we photograph. Another great factor is that we were able to create these handmade, unique items at an incredibly reasonable price. We calculated that, at the current quantity we produced, our material costs were about $1 or less per complete card. You’d spend more than that buying something generic and not customized to your business! We hope that you enjoyed seeing our cards and how we made them and that they inspire you to go out and create your own custom items to represent who you are. You guys!!! This all looks amazing!! 🙂 I love the little muslin bags & lavender. Such a great way to touch several senses at once & create brand recognition. Can’t wait to see how the bridal show goes. All the best!!! Wow! Get ready to start shooting…a lot! !